Sam Graham in Science & Technology on 6 October, 2015. Skara Brae- the Neolithic settlement that gives us an insight into what humans were up to 5000 years ago. In the four and a half billion years since our planet formed from interstellar dust and gas, it has created a stable atmosphere, built continents and oceans of liquid water. In this time, Earth has also achieved something apparently unique, it has harboured life. Over the vast expanses of geological time life has diversified from simple single cellular forms through simple parazoan organisms and onto the huge number of complex multicellular organisms we see today. With the passing of the years, nature has duly selected species for extinction, most going quietly leaving no trace of their existence, with the lucky (or could you say stubborn?) few becoming fossilised – a ‘permanent’ reminder of their existence. The process of fossilisation may simply leave behind a carbonised film on a bedding surface, or may form a perfect cast of the animal on the day it died, however this begs the curious question, how will Homo sapiens be remembered in the rock record? Of course the answer to this question is somewhat speculative, yet we only need to turn to archaeology to begin to answer this. A lot of what we know about human settlements over the past 12,000 years comes from the uppermost layers of the stratigraphic column, namely the unconsolidated ‘modern’ sediments and soils. 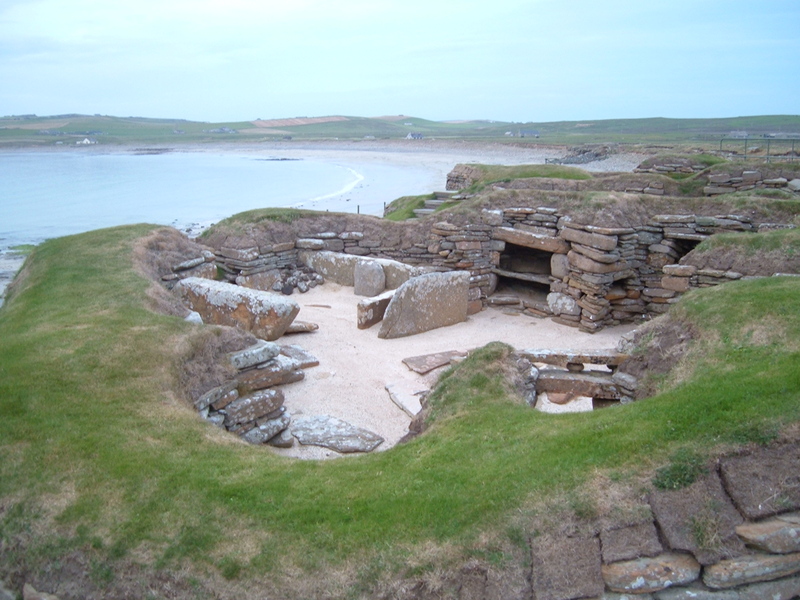 It is easy to think that had it not been exposed thanks to a vicious storm in the winter of 1850, the now world famous Neolithic settlement of Skara Brae would have remained buried under soil. With the further passing of time it became what is known as a paleosol, essentially fossilising Skara Brae, preserving a snapshot of early human activity in the Orkneys as part of the rock record. In saying this, I am not for one minute trying to convince you that the next super intelligent species, or visitors from other worlds are going to one day stumble across a perfectly preserved central London, or to find the Empire State building perfectly entombed in sandstone, but rather that the increasingly inorganic nature of human lifestyle may ideally lend itself to preservation over decay, paving the way for a myriad of anthropogenic ichnofossils that stretch beyond footsteps in the mud. The answer to this question is likely to be more subtle. The scale of individual human settlements is relatively small, whereas the greater influence of human activity is widespread, nor anymore restricted to the pale blue dot we call home. It is the more widespread interaction between humans and the planet (so much so that the biosphere is sometimes subdivided to include the anthroposphere) that has fuelled the debate as to whether or not we should mark an official end to the Holocene – the era of geological time we now live in – and define a new epoch, the ‘Anthropocene’. Some argue this should be marked by the first arrival of Homo sapiens, others would argue for the industrial revolution or 1950 on the grounds that these dates mark the onset of the mass burning of fossil fuels, mass mining, nuclear tests, mass production of plastics and the onset of anthropogenic climate change. The mass production of plastics is an interesting point to follow as current research is starting to suggest that it is likely to be preserved in potentially large quantities in sedimentary rocks – the rock type that best preserves evidence of ancient biological systems. In order for sedimentary rocks to form there are three essential elements, a source, a site of deposition, and a means of transporting particles from one to the other – the sediment itself is less well defined. It can be individual mineral grains or rock fragments, so why not plastic? Settlements have historically been founded, for obvious reasons, around sources of water and rivers are no exception. Rivers are perfectly suited sediment transporters and the thickest sequences in actively filling sedimentary basins receive their sediment from rivers (rather than biological, chemical or wind driven mechanisms). Humans have long used rivers as a means of waste disposal and many of the UK’s sewage systems ultimately rely on rivers, yet this is all organic material. With increasing urbanisation and the mass production, plastics and other such materials will also find their ways into to the river – as litter is washed into drains and onwards to the sewers, you can see where I’m going. A 2012 joint study by the Royal Holloway University and the Natural History Museum in London effectively fished the Thames for rubbish. Without trying to make this sound like a glorified piece of GCSE Geography coursework, nor trying to state the obvious, it manages to add tangible numbers to a serious point. This simple survey put a small number of nets out along a 5km stretch of river and in only a few days collected over 8000 pieces of junk. It is worth considering that this value is essentially a point measurement and scaling this up for the whole river on a human time scale, the magnitude of the matter becomes apparent. This is going to be repeated for practically all of the world’s rivers. For those feeding actively filling sedimentary basins, that’s a lot of anthropogenic sediment in the mix. Also on the theme of plastics, research in Hawaii has started to turn up evidence for another anthropologically formed rock, so-called ‘plastiglomerate’ – essentially a composite of man-made polymers and naturally occurring volcanic basalt. The authors concerned attribute the formation of this plastiglomerate to camp fires on the beach studied but extend the notion of such rocks being formed from plastics in the environment (litter) interacting with other extremes of temperature, namely forest fires and lava flows. It would be fair to call the evolution of Homo sapiens a major event in geological time – after all we are the most advanced species to ever evolve. Other major geological events have left sharp chemical signals as a reminder, the sharp spike in iridium following the end-cretaceous extinction event for example. Given the extent of our industrialised society, it would seem reasonable that we would also leave behind a potent chemical signature. In the UK we are fortunate to have sound legislation preventing industry from simply dumping its toxic waste into rivers or landfill, yet in the developing world this is far less stringently regulated, with large amounts of heavy metals such as mercury, cadmium and gold being frequently dumped in landfill and watercourses. Of course we shouldn’t forget the radiogenic signal we will leave behind thanks to our nuclear industry and the testing of nuclear weapons. It is clear then that the legacy of the human species is going to be somewhat more than some bones in the ground or some footprints in the mud. If as a species we are not already on the path to self-destruction, then given the passage of time nature will select us for extinction. Should, in a few million years time a small probe reach us from a distant world, life of some kind will be there to greet it, however if it is equipped to sample the earth it may wonder how life possibly survived before? The answer to this may have been best put by the great satirist Tom Lehrer; “don’t drink the water and don’t breathe the air”!